While some herd-following fans might cling to Billboard and watch CMT to find their country music, the more discerning look to other means. Just off the beaten track, far from the white noise and babble of modern radio, and the touted ramblings of Nashville’s music machine, there is a new, exciting, and durable alternative: the independent artist. To say I am a fan is an understatement of fact. Across a catalogue of nine albums, Kimes has delivered memorable and meaningful music. To add calibre to the output, most of it is self-written. Kimes is no cloned wannabee. He doesn’t need the entourage, the spin of a publicist or the touring bus with a 60 inch plasma – he just writes, sings and plays what he feels. And what he feels he delivers with understood conviction. He is authentic. That is what makes every new RWK album an event for this listener. 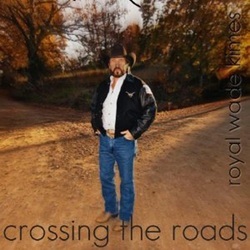 Now with Crossing The Roads (Wonderment Records) Wades proves, convincingly, consistent talent and perseverance may not get you the bus, but it sure gets you a ticket to ride. The album opens with the dated (1963) Bobby Bare classic “500 Miles Away from Home”. I once described Kimes as a singer with a velvet growl. Hear this and you will understand. Also worth a mention is the making of the video. Kimes created history by tracking the shoot over a 500-mile trek. (The video is on YouTube). This album ambles, comfortably, along the well-known route of ballads, heart-tugs, and toe-tappers. All covered in charmed style with Kimes’ laid-back mellow tones. Standout cuts include the made-for- a-campfire “I’m An Ole Song,” the bluesy and piano-ridden “One Shot,” the truth of times change as do people on “1969,” and the simple, but powerful, rendition of the religious classic “Amazing Grace”. The strength of patriotism and a nod to ideals of the right to bear arms all carry the weight of Kimes’ committed beliefs on his self-written “In My Land”. Powerful. Royal Wade Kimes is a crafted performer, a noted writer and a stylish edition to your collection. Dare I say…well worth crossing roads for.